Someone told me 7-Eleven was offering FREE Slurpees today and I wondered why. Then I was smacked over the head and asked what the date was. I looked and said, "so what?" and was smacked again. Then I saw the light - because it's 7/11. So go to your local store from 11am-7pm and get a cool one. If you don't have a 7-Eleven near you I feel your pain. I lived in a town that didn't for a year, and I felt like a part of my life was missing. 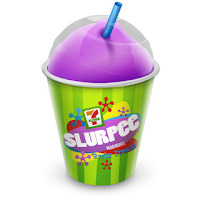 Click here to view the offer and to watch the Slurpee Dance. I dare you do do it after your first sip.